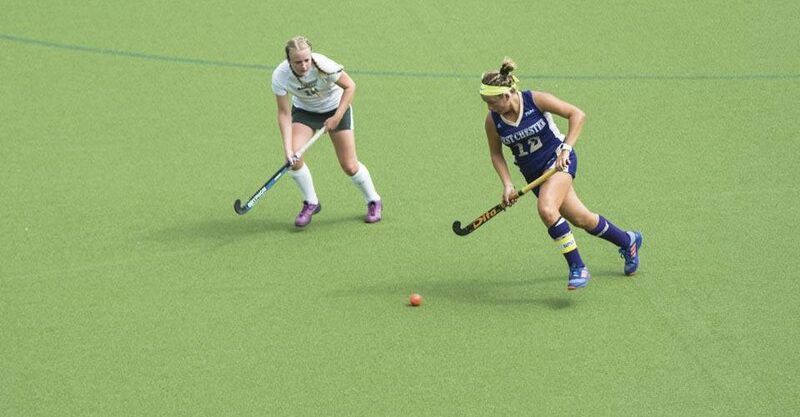 Based on the first half of the season, nobody would have expected the second-half dominance that continues to be shown by the West Chester University field hockey team. They went from going 1-1 every single week to reeling off a seven-game win streak to close out the regular season, including a pair of wins this week against Millersville and Seton Hill Universities. They also clinched third place in the PSAC, and guaranteed themselves a home game in the quarterfinals of the PSAC tournament. If the Golden Rams want a chance at some postseason action, every game to close out the season is virtually a must-win situation for them. Based on these last few weeks, they definitely know how to show up in big games. West Chester opened up the final week of the regular season with a home matchup against the Millersville Marauders, who sat two spots above them at No. 3 in the first NCAA poll of the season. Freshman Maya Gulliksen’s spectacular first collegiate season continued in the 30th minute against the Marauders, when she notched her fifth goal of the season thanks to an assist from Dayle Paustian for a 1-0 WCU lead. Millersville quickly erased the West Chester lead 10 minutes later with two goals eight minutes apart in the 40th and 48th minutes by Taylor Parker and Aliza Mizak, respectively. Marnie Kusakvitch evened up the game for the Golden Rams with her 11th of the season thanks to an assist from none other than the freshman Gulliksen. The 70 minutes of regulation weren’t enough to decide a winner between the two sides, and the Golden Rams and Marauders headed into overtime. If someone ever wanted to score their first collegiate goal in one of the most important games of the season for West Chester, now would’ve been the perfect time. Thanks to senior back Nikki Bennet, WCU got just that. Just 51 seconds into the overtime frame, Bennett tipped a Paustian blast into the back of the cage to not only secure the win for the team, but also give them sole possession of third place in the PSAC. Rolling off of their sixth straight victory, the Golden Rams closed out the regular season on the road against Seton Hill University. Held off the scoresheet against Millersville, WCU’s leading scorer Rachal Toppi was bound to have a good game, and she did not disappoint. Toppi opened up the scoring in the eighth minute for West Chester for a quick 1-0 lead. Gulliksen continued to impress with her sixth goal of the season in the 27th minute for a 2-0 leading heading into the half. One goal in the game wasn’t enough for Toppi, as she tacked on two more in the 39th and 48th minutes to complete the hat trick, bringing her goal total on the regular season up to 22. Not to be outdone, Kaitlin Hatch picked up a hat trick in the assist column, picking up two assists on Toppi’s goals and another on the Gulliksen tally. The 4-0 victory was definitely the exclamation point to end a dominant second half of the season for the Golden Rams, who outshot the Griffins 29-2 total in the game and held a 21-4 advantage on penalty corners. A team can’t ask for a better way to close out a season than a seven-game win streak. With the PSAC tournament starting up on Tuesday, Nov. 2, the Golden Rams need to keep the pedal to the metal and prepare for a quaterfinal matchup against Indiana University of Pennsylvania, a team who they faced twice in the regular season. The first matchup saw a 1-0 Golden Ram victory, while the Crimson Hawks claimed revenge in part two 3-2 back on Saturday, Oct. 1. Thankfully for West Chester, one thing they know for sure is they’ll be playing in the comfort of Vonnie Gross field on Tuesday, where they’ve accumulated a 9-1 record during the regular season, thanks in large part due to the great support they receive from the fan base made up of parents and fellow Golden Rams. A 4 p.m. showdown with the Crimson Hawks on Tuesday, Nov. 2 will most likely be the final home game for the Golden Rams this season, so come out and support the field hockey team as they conitnue their quest for PSAC Championship. Dylan Harrison is a fifth-year student majoring in communication studies with a minor in journalism. He can be reached at DH785892@wcupa.edu.